Akshay Kumar gets an aggregate makeover in his new film. 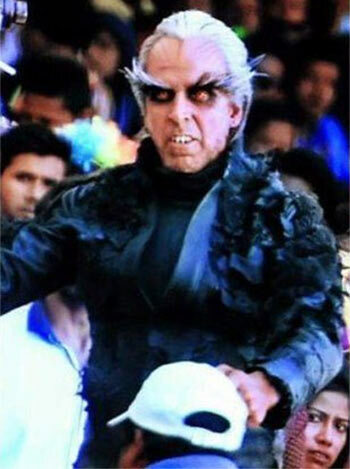 Akshay Kumar's look from the Enthiran (Robot in Hindi) spin-off - titled 2.0 - appears to have been spilled, and he's scarcely conspicuous! The on-screen character plays a scalawag in the Rajinikanth-starrer, coordinated by Shankar. As indicated by reports, he plays a distraught researcher, enlivened by a crow! Akshay is certain playing his first negative part truly, giving himself a complete makeover for the film. His look from the film was tweeted by his business accomplice Ashvini Yardi. Rajinikanth will repeat the parts of Dr Vaseegaran and Chitti in the film, co-featuring Amy Jackson. What do you think about Akshay's look in the film?